A bouncing new Baby Peter-Wright!!! Who says bigger isn't better? Newest member of the Caffrey family...... 508lbs of Bouncing Baby Peter-Wright! Arrived today, unloaded, and in the shop. Now to do some cleaning/dressing, rework the anvil stand to the correct height for this anvil...... and away we go! Congrats is a boy, a big boy! Now that is truly an anvil to be proud of!!! This shot says it all. That top is just pristine. Has it ever been used?? I get such a warm fuzzy feeling looking at that! It's absolutely gorgeous! The picture with Ed in it makes it look smaller than it really is. It's MASSIVE. He's a cute little fella. Man, I love Peter Wrights. I started forging on a broken Peter Wright. Guess what I bought when I was able? 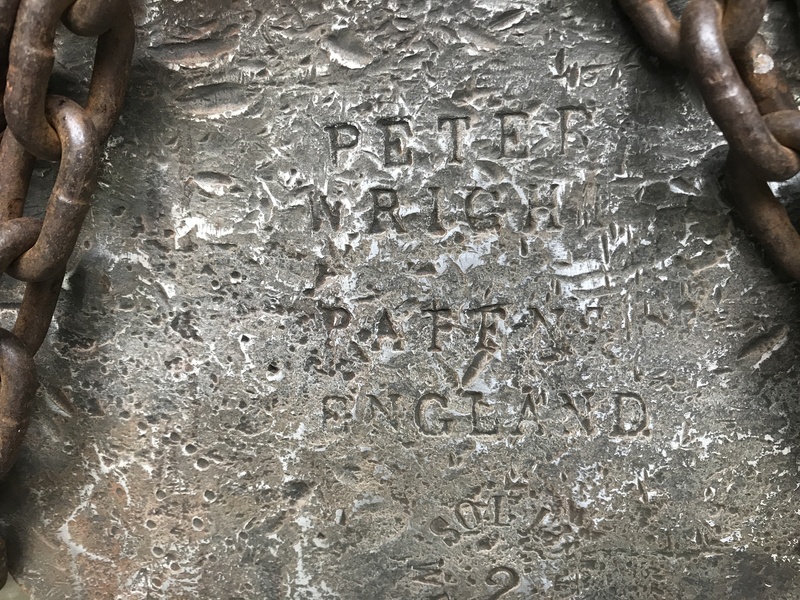 A Peter Wright. 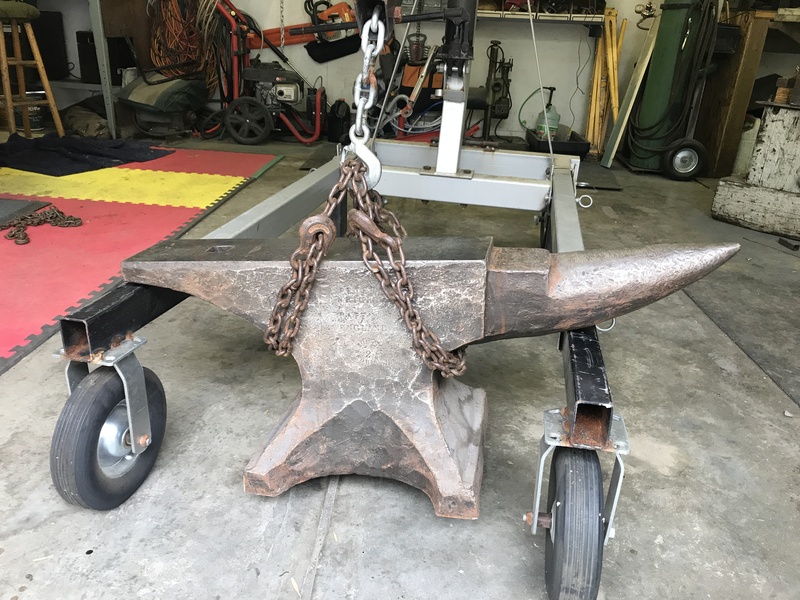 I have never struck on a 500 pound anvil, I bet it is awesome. Nice score Ed. 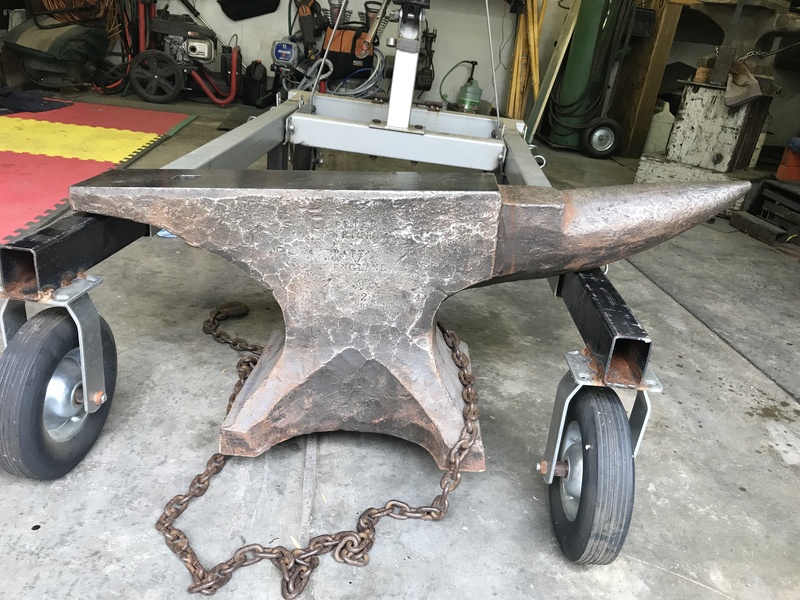 It was spendy, but having worked on this anvil in the past, and given that it's in near mint condition, I figured it was a once in a lifetime find, just couldn't pass it up. The Docs still haven't figure out what's going on with me, so right now I have two speeds.....slow and off, so getting it setup and in use will be a slow process......but at least it's in the shop! I fondled it when Ed wasn't looking, after being threatened for touching it...HA! And you're help with the offloading is much appreciated Brian! But then you had to tease me with that sander...... not another one in town! I suspect you bought the last one, just so I wouldn't get it! Ed, I told my doctor basically the same. His response was your getting old. Can't say what I told him here as I like this forum!! Ed, wishing you the best with finding out the root of the cause! The anvil is a beaut!! Nice! I don’t do much forging. 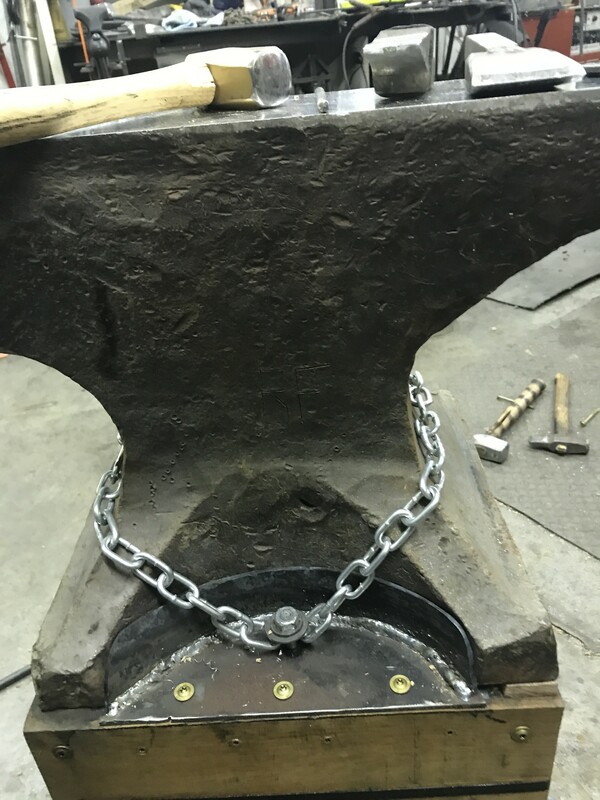 I only have a piece of RR track for an anvil. The surface area on that anvil looks awesome. With Cindy's help (and the engine hoist), the new baby is in it's home! 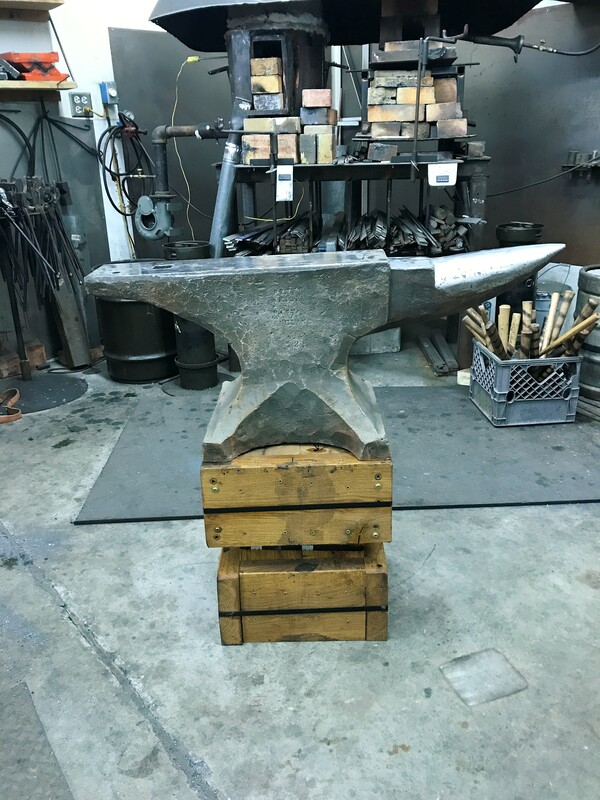 I had to trim down the height of the anvil stand by 1 1/4" to get the correct face height, and still gotta level it out/shim up the rear (funny, this anvil is about a 1/2" shorter on the back feet then the front). Nothing major. 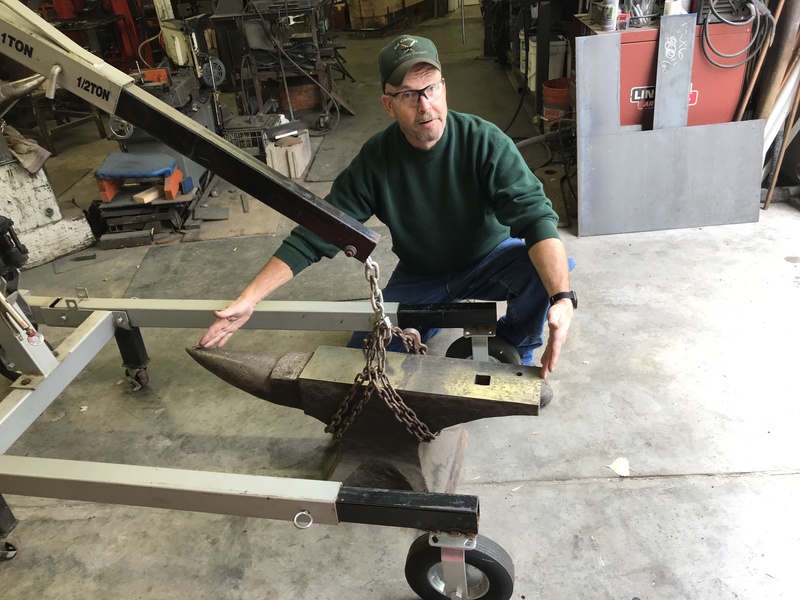 Then the plan is to forge some some "hold downs" for each side of the base.... but I doubt this thing will move around any ..... but just in case. That's gona have to wait until I'm feeling a bit better....not sure I could swing the hammer in my current condition. Heading in for a chest CT tomorrow....so hopefully that will tell the Docs something. Anyway, it is what it is, and I'm just exited to have the new anvil almost ready to rock! Ed, I wish nothing but the best for you with the health issues Bud! Never seen a Peter Wright that big. Nice score Ed. I bet its like hammering on a football field that thing is huge. You can swing a 12 pound sledge on there. Glad you'e having fun, Ed. 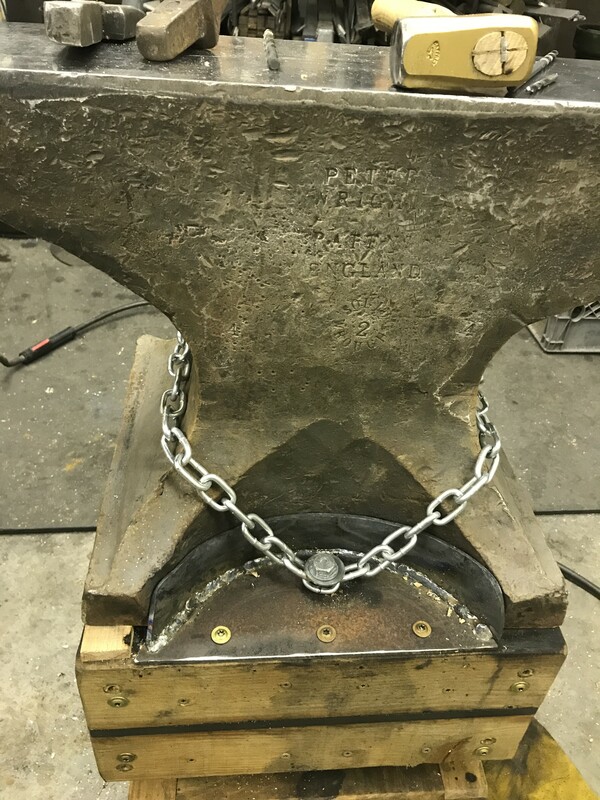 It took me all day, with a lot of rest breaks, but got the anvil "tied down"...... built a couple of "plates" to lock the feet/waist in place, then just for the sake of overkill, chained it down too. Now if the Docs will just do their jobs, and get me medically back up to speed, I'll get to hammer some hot steel on it! This thing has a 1 1/2" hardie hole, but all my existing tooling is already setup with 3/4"..... so the next step will be to build a "sleeve" to neck the hardie hole down to 3/4".